Karen Kramer with daughter, Stella Grace, shortly after giving birth at home. The use of midwives to help with home childbirths is an ancient and honored tradition in many societies around the world. But in the United States, midwifery began to fall out of favor in the mid-19th century, as the number of medical doctors and hospitals grew. By 1935, 90 percent of all births in America were taking place in hospitals, attended by doctors. And by the 1950s, most American states had outlawed the practice of midwifery altogether. Today, though, the laws are changing, and midwives are making a slow but steady comeback. In Nashville, Tennessee, Karen Kramer is getting a checkup from her midwife. She plans to give birth in her own home, a rare choice in the United States. Kramer delivered her first two children in the more typical American way, in a hospital with a doctor attending, but she wasn't completely happy with either experience. During her last delivery, for example, nurses whisked her newborn away immediately and didn't return with him for three hours. There were no complications, she says, the nurses were simply busy. "And the whole time I kept sitting there thinkin' 'I can't believe I just had our second child and I'm not with him, I can't hold him, I can't nurse him, I can't be with him' and that was really hard for me." Kramer also believes she suffered unnecessary pain because of what she considers to be the hospital's aversion to risk and legal liability. She wanted to get up and walk during labor to relieve the stress in her back, but she says the staff insisted she remain in bed. Karen Kramer works through labor pains shortly before giving birth at home. "When I walk in to give birth to my child this time," she says, "I don't want to be viewed as a liability." Midwives have attended all four of Amy Hamiter's births. She says people are often shocked, sometimes even appalled, when they learn she's given birth at home, without a doctor present. "People have this notion that we're all alone and that I'm birthing out in the dirt or something," she says. "I don't think that they quite grasp that our midwife knows what she's doing. She's trained." Midwives have at least three years worth of training, according to Nurse Midwife Mary Anne Richardson. It can take that long to get licensed as a Certified Professional Midwife or CPM, even longer to become a nurse midwife. "They estimate a minimum of 1,350 clinical hours spent for the CPM to get that certification. So it's not something you can just go out and do, you know, fill out a piece of paper, pay your money and acquire a CPM certification," she says. Once certified, there's no shortage of work. Midwives attend more than 300,000 births in the U.S each year, in hospitals, clinics and homes. Only one percent of all deliveries take place outside a hospital setting. On average, in-home births in America are growing by three percent per year. Richardson - who only attends home births - says she's turning some new clients away. "My heart breaks because people call and I say, 'I'm sorry. We're full for January. I'm sorry we're full for February.' And there aren't enough midwives to handle the calls we're getting." Midwives have at least three years worth of training, according to Nurse Midwife Mary Anne Richardson. Dr. Mavis Schorn is trying to change that. She directs the Nurse-Midwife training program at Tennessee's Vanderbilt University. "Midwifery was almost gone from this country before the 1960s," she says. "So it's really built significantly since then." Schorn says many Americans still view birth as a thing to be feared, seeing delivery as more of a medical complication than a natural process. She says that's why many mothers-to-be might feel more comfortable with the fetal monitors and other medical resources available in a hospital setting. "There's still this thought that more technology is better and that if we hand ourselves over to technology and to the highest possible education that we can find that we're gonna have the best outcome. Well, that's not necessarily the case." Though some women who have unexpected complications during childbirth do end up going to the hospital, life-threatening emergencies are rare. In spite of this, it's still illegal for midwives to attend births in 10 of the 50 American states. Amy Hamiter hopes to be an even bigger part of the home birth revolution. She's now studying to become a nurse midwife and is something of an evangelist on the subject. She's even placed a video of her most recent delivery on the internet for others to see. "This is a natural process. This doesn't have to be a big medical event," she stresses. "Of course, there are times when intervention is needed and it does save lives, but in healthy pregnancy and healthy labors, the mom and baby are going to be just fine if they're left alone." Stella Grace is welcomed to the world shortly after being delivered at home. But the debate goes on. The American College of Obstetricians refers to home births and midwives as "trendy" and "dangerous" and says the rate of fetal death is much greater in a home birth - a statistic disputed by Mavis Schorn. She points to studies which suggest that home births are just as safe as hospital deliveries. Health professionals caution that a home birth is best suited to healthy mothers whose pregnancies have been uneventful and where complications are not expected. 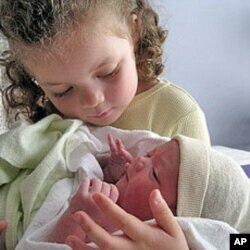 Like with Karen Kramer who, at home with a midwife, delivered her newest child, Stella Grace.